If you want to unlock your PC’s full potential, increase its responsiveness, and be the first to load in-game, SSDs are more often than not the most crucial component. We are lucky to live in a time where the prices of these components are finally becoming more affordable for the average gaming Joe. Solid State Drives are significantly faster than their older and slower little brother, mechanical drives. They don’t have any moving parts – you can think of them as large flash drives for your PC. Over the years, even SSD technology has evolved. There have been three SATA generations released since its inception, and now, computer engineers have rolled out NVMe SSDs that use your motherboard’s PCI express port, as opposed to a SATA cable. Since PCI connections are significantly faster than regular SATA, third generation NVMe SSDs are lightning fast, even when compared to traditional SATA III. 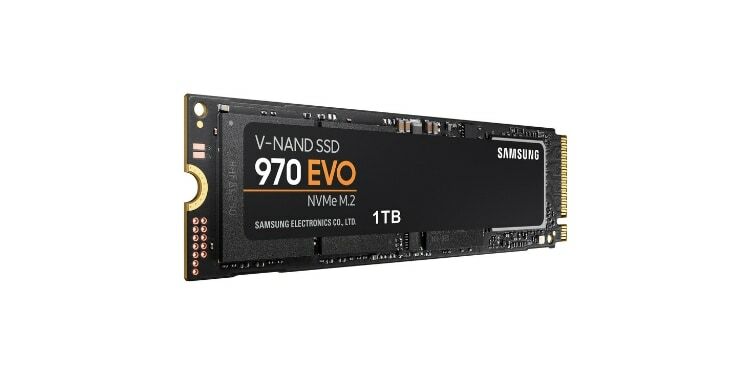 The Samsung 970 EVO is the best NVMe SSD on the market, at least in our opinion. At a little below 40-cents-per-gigabyte (it varies from capacity to capacity), the EVO SSD sits comfortably in terms of affordability when compared to other NVMe drives. Overall, the Samsung 970 EVO SSD will definitely exceed your expectations. It’s a great storage option for gaming, as you’ll load incredibly quickly. If your PC takes forever to load now, adding a solid state drive will boost the speed of your gaming PC tremendously. Affordability and outstanding performance combine to make the Samsung 970 EVO first on our list. 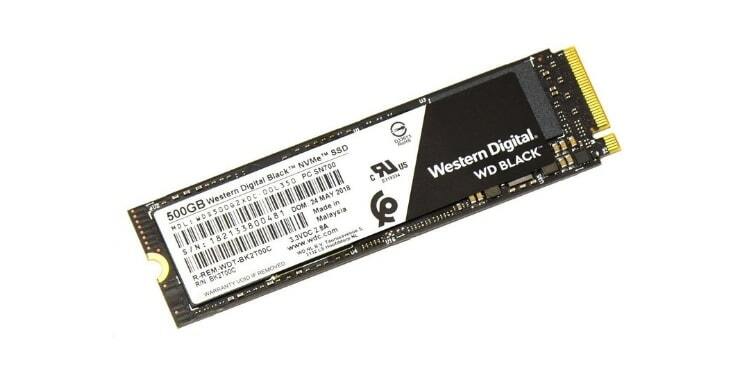 Whether you are running high-end programs or loading even the most intensive AAA titles, Western Digital’s WD Black NVMe SSD is always clutch. The best aspect of this storage drive is certainly the many choices you have with regards to size options. The drive’s high capacity is more than enough to store your favorite games, files, drivers, and your Windows OS as well. When it comes to quick boot speeds and responsiveness, the WD Black NVMe SSD is a game changer. Being the fastest NVMe on this list, its sheer performance, abundant storage options, and reasonable price make this SSD one of the best on the market. Yes. The storage sizes for this drive are really small. And yes, it’s kind of expensive. In fact, it’s a terrible value; both versions cost over $1 per gigabyte, which is really bad. It’s also worth noting up front that this does use a PCIe x2 slot instead of the more standard x4 slot which is seen on most of the other SSDs on this list. 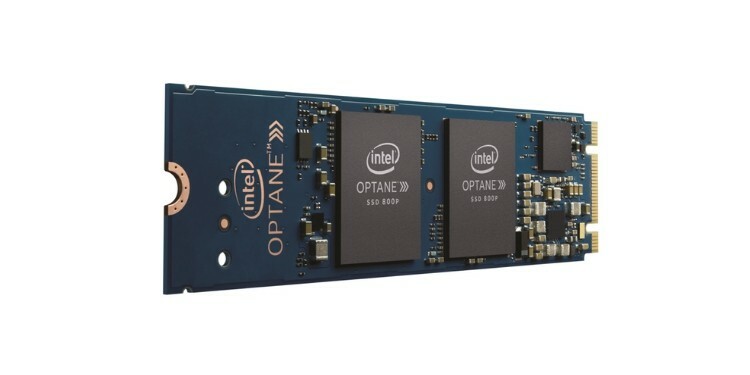 Ultimately, the description of this on Amazon says it best “The Intel Optane SSD 800p is an ideal OS drive, delivering fast boot, application launch, and smooth multi-tasking.” I can’t really promise it helps a ton with multi-tasking, but that first part about it being ideal for your OS is pretty spot on, because frankly, you aren’t going to fit too much else on it. Okay, that’s dramatic, you might be able to fit a couple of pieces of software on it, but don’t expect to fit many games on it. Still, if you’re using this mainly for your OS and drivers, and then use an HDD or separate SSD for your other software, you should be fine. This drive is among the nicest SSDs on the market. If you want a drive that’s lightning fast, full of storage space, and reliable, then the Optane 950P is definitely a strong contender. Unfortunately, it has quite a hefty price tag, so it’s best for enthusiast builders with a large budget. Whether you’re gaming, loading video footage, editing, or rendering, this drive can handle such tasks with ease. If you’re in the market for sheer performance, this is the drive for you. Known to be one of the fastest drives on the market – thanks to its lightning-fast read and write speeds – the 970 Pro is a favorite among PC gaming enthusiasts. Despite being one of the fastest drives available today, its speed advantage over other SSDs is insignificant when compared to its high price tag. In other words, you’re paying a lot more for only a bit of extra performance. With that being said, if performance is what you’re after – and money isn’t an issue – you should consider purchasing this solid state drive. On the other hand, if you’re on a limited budget, it would be better for you to purchase a cheaper drive with similar performance ratings. That way, you’re getting the best bang for your PC gaming buck. 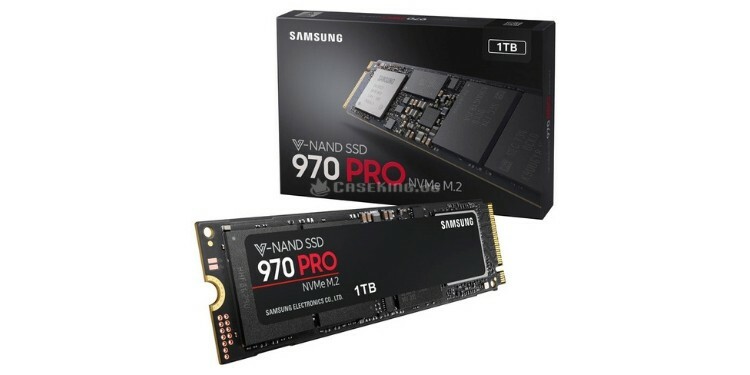 Overall, the Samsung 970 Pro is a beast of a drive, offering 1TB of storage space – more than enough to play of all the games you want at peak performance. It may be a little expensive, but this powerful yet efficient drive is reliable and fit for any gaming or workstation related task. Without a doubt, the Plextor M8Pe NVMe SSD is – despite its high price tag – a spectacular drive. The M8Pe is Plextor’s top-of-the-line product, boasting the company’s best performance scores across the board. Games load quickly and, even when gaming while performing another task on the side, my PC remains responsive. It’s safe to say this drive was designed with gamers in mind, especially those who like to multitask. This storage device delivers a wonderfully smooth gaming experience, even when it comes face-to-face with games that require demanding read/write operations and processing. 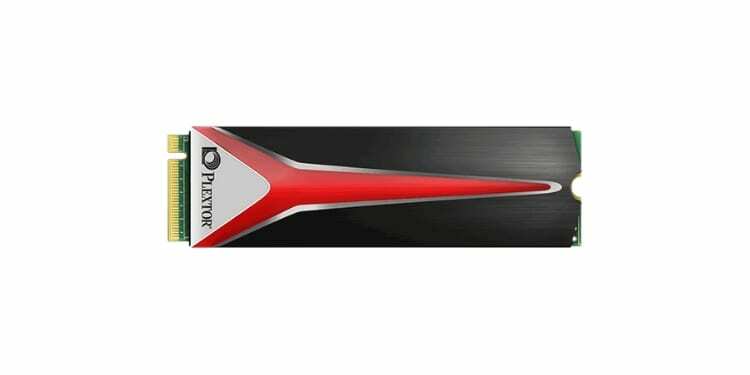 Although the Plextor M8Pe 512GB SSD is last on our list, it’s not last in our heart! As we look towards the future of storage technology, we see drives that are smaller, faster, and more efficient than ever before. Once SATA cables reached their performance ceiling, computer engineers developed M.2 drives, which are both smaller and faster than traditional SATA SSDs. Believe it or not, today’s SSDs– despite their smaller form factor– can carry up to 4TB of storage space on a single drive. Still, finding the best NVMe SSD is trickier than it might appear. In this part of the guide, we’re going to discuss what you need to watch out for before you buy. There are three main factors when discussing SSD compatibility with your desktop or laptop. The form factor, interface, and bus type. The form factor, or in other words, the size, is the most important to know before making a purchase. You will most commonly find form factors labeled 2.5-inch and M.2. M.2 drives are very small SSDs that can be used in both laptops and desktops if compatible. They’re usually mounted in your motherboard’s PCIe slot, although some M.2 drives still use SATA connectors. This is something to consider, as it will have a tremendous impact on your drive speed. Just about every NVMe SSD being sold today uses the M.2 form factor, though there are some exceptions to this rule. Make sure your motherboard is compatible with your SSD before you buy! Next, we have the interface, which is different from the form factor. This is the part that is used to connect your SSD into your laptop or desktop. For instance, PCIe SSD interfaces only fit in your desktop. 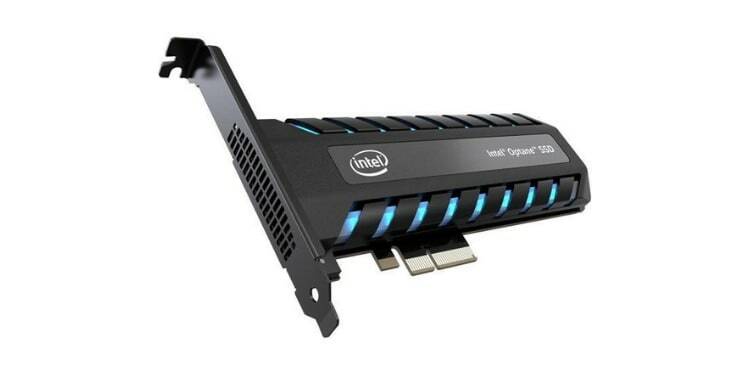 The SSD’s interface is the method it uses to connect with other components in your system (SATA, PCIe, SATAExpress, etc), as opposed to the form factor, which can be thought of as the size and shape of the drive. SSDs come in a variety of different interfaces, based primarily on the performance requirements for that particular SSD and your system. The Serial ATA (SATA) interface, which uses something called a blade-connector and requires a SATA cable, is used with 2.5” SSDs (and also HDDs). M.2 drives contain a single bladed-connector. Finally, there is the bus type. The bus is basically the data pathway from the SSD to the system. You need to know the type of bus your system has in order to buy an SSD that is compatible with your motherboard. This is where things get sort of confusing, but hang with us. For example, any SATA SSD drive that you purchase– regardless of its form factor– will require a SATA bus. This is a case where the Serial ATA and the bus are the same. Some M.2’s use a SATA bus while others– the NVMe drives– use the PCIe bus. The SATA M.2’s don’t use SATA cables, like the 2.5” SSDs, though, hence the different interface. NVMe’s fit into your motherboard’s PCIe slot, which is where it gets its huge speed. This means you need to be aware of what your motherboard supports as well as what your drive supports. This is sort of a simplified version rundown, though. If you’re still confused, then a great visualization might help, so check out this infographic from the r/PCMasterRace subreddit. You also might find Science Studio’s video on the topic helpful as well. You’ll have to consider how much storage you’re already using, as well as how much storage space you think you’re going to need in the future. The kinds of games you play– AAA games are way bigger than indie titles, after all– and the number of games you like to have installed at one time will be the most important factor to consider when it comes to selecting a storage size. You’ll want at least 250GB for your Windows OS, drivers, and your favorite games. If you want more than 6 or 7 games installed at once, you should probably pick up a 500GB drive instead. Finally, you should take each drive you are considering and compare its cost per gigabyte. You can find the cost per gigabyte by dividing the price of the drive by the capacity of the drive. Let’s take the Samsung 970 EVO 500GB, for instance. The EVO SSD price according to Amazon is at $149 and contains 500GB of storage. 149 divided by 500 is $0.298. That is less than 30-cents per gigabyte. Use this technique to understand how much you’re actually paying compared to the amount of storage you’re receiving. Often times, SSD performance is pretty similar, so you’re better off going for the cheapest drive that suits your storage needs. We understand that searching for the best SSD for your PC can be quite daunting, to say the least. Whether you are an aspiring or experienced PC builder. the search for the perfect SSD isn’t always easy.